Man Arrested for Selling Counterfeit Brand-Names | South Carolina Personal Injury Attorneys | Criminal Defense Lawyers - Strom Law Firm, L.L.C. Deputies in Kershaw County recently arrested a man from Elgin, South Carolina for trafficking counterfeit items. 65-year-old Frederick Bartlett was arrested on Wednesday, March 6th, after a warrant was signed for his arrest. Officers seized $342,000 worth of counterfeit goods from his home, as well as $1336 in cash, a 2003 Ford van, approximately 4,500 counterfeit Monster Energy heat transfer logos, 2,500 counterfeit Hollister heat transfer logos, 4,600 Harley Davidson counterfeit heat transfer logos, 2,000 counterfeit NCAA heat transfer logos from different colleges and universities, and a handful of assorted other counterfeit heat transfer logos. Among the fake trademarks were the following: Monster Energy, Hollister, Harley-Davidson, Nike, Browning, Dodge, Ford, Chevy and various NCAA teams. Investigators also seized the machinery Bartlett used to create the counterfeit items. “He was putting Great Smokey Mountains, Pigeon Forge with the Browning symbol, which is a patented trademark, which is clearly illegal,” said Jamey Jones with the Kershaw County Sheriff’s Office. The Tennessee Attorney General contacted South Carolina authorities after they noticed counterfeit goods appearing in Bargain World in Gatlinburg. The office raided a home in Gatlinburg and found a huge stash of counterfeit clothing and sports memorabilia. Investigators have asked anyone who bought goods from Bartlett to sell in retail outlets to come forward. According to reports, Bartlett was heat pressing thousands of college and university logo tees, sweatshirts, and pants, as well as brand-name items. “As you can see here the tags were cut, so he was buying them at a low, low cost,” said Jones. “We were really surprised to find out it was in our backyard but it was products likely like ours,” said lead Motorclothes Consultant Trayci Brazell. Harley Davidson recently reached out to their customers, informing them how to tell real Harley Davidson merchandise from counterfeit. Bartlett is currently in the Kershaw County Detention Center pending a bond hearing. He was arrested for “trafficking in counterfeit items in excess of $50,000,” which is a very serious charge. Counterfeiting is the creation and/or selling of fake or “replicated” goods, including currency, although it is primarily seen in regards to clothing brands, software and other tangible goods. Counterfeiting is considered to be a serious white collar crime and investigators across the country are cracking down on the selling of counterfeit goods. 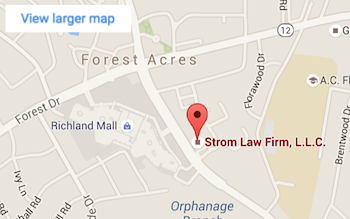 The Strom Law Firm, LLC was founded in 1996 by former U.S. Attorney Pete Strom. Our Criminal Defense Attorneys aggressively fight trafficking and counterfeit cases, both on a state and federal level. Don’t wait until the verdict is in to contact us. The earlier you contact, the more we can help. By contact us in the early stages of your case, we can more effectively defend you and help clear your name. We understand your financial and emotional well-being, as well as, your reputation is at stake. Contact the Criminal Defense Attorneys at the Strom Law Firm today for a free case evaluation. 803.252.4800.